"We are the serious ones. The first. The bravest. The ones who will represent America as it should be." "To the shore, to the lake, to anyplace where there are waves and ice cream and umbrellas." "Dear Future, she writes in her head, imagining the strokes of her pen as though it is moving across sand, illuminated every so often by a large searchlight. When I see you, though you've been waiting there, pulsing so faithfully. Please help me to want you. Dress yourself up or offer warm soup or a long-lost friend. A surprising tear escapes, unannounced, as she imagines Lowe coming to find her. Remorseful and contrite, his arms holding her tight, rocking her along with the rhythm of the train. Despite her best efforts, she's still just a girl whose heart has been broken." "Had they known how life would become a dark, narrow hole in which they would sleep less than they ever thought possible, hardly ever see a horizon without smoke or fire corroding its edges, eat turnips and potatoes that have been boiled into a bitter white mash at nearly every meal, they might have enjoyed even more those empty days that began with overly salted sausage and sweet jam, were filled with long walks across tangled, abandoned vines and beneath thick groves of apple trees, and ended with cognac, a piece of Toblerone, and the BBC on the wireless." 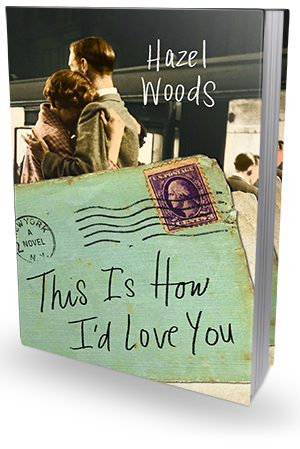 This Is How I'd Love You is about 300 pages long and, while it's perfect and completely satisfying just the way it is, I found myself wishing it was much longer. I just couldn't get enough. I finished this book and I felt both enriched and hollowed out, mesmerized and totally heart-broken. I don't believe it's possible to describe just how beautiful, magnificently written, harrowing and powerful this novel is. You just have to read it for yourself. You SHOULD read it for yourself, for I really believe this to be a must-read for anyone who enjoys good, almost cinematographic historical fiction with a huge, beating -and bleeding - heart. Or, quite frankly, for any book lover out there, no matter your genre preferences (as long as you are mature enough to handle and fully appreciate the subject matter). The plot line of this book follows two narrators - Hensley and Charles - and we get to know them through third person's narrative (which I personally absolutely adored and thought it worked brilliantly here). We meet Charles minutes after he boards the ship that will take him to France, where he'll join the American troops. He's a young medic, passionate and dedicated, and determined to support his country's war efforts by treating the wounded. Even though it is completely against his family's wishes. Similarly, we meet Hensley as she embarks on a journey of her own, taking a train down to New Mexico where her father, who up until recently worked for New York Times as an anti- war writer, will be overseeing a gold mine. Overwhelmed by the sense of loneliness and uprooted from her exciting, glamorous New York City life, she finds herself in desperate need of companionship. That burning need leads her to high-jack her father's correspondence with Charles, with whom he was matched as a pen-pal chess partner. And so their unforgettable, transcendental and absolutely mesmerizing love story begins. Both Charles and Hennie are fascinating, complex characters with clear, strong voices and distinct personalities. They are fabulous - each on their own and together, growing more attached to one another with each exchanged letter. And they are not the only ones worth knowing. Hennie's father is a very interesting character, too. He is a pacifist, with certain opinions about the war that he is not afraid to express, though, clearly, they are not very popular at the time. I found myself nodding along to his thoughts and pausing to consider all the things he'd say to Charles and Hensley. Things like: "Where is the absolution of religion now? Morality is not negotiable, Hensley. Unleashing a war machine in order to end a war? An absurd Olympics of semantic excuses. Ludicrous." This is a phenomenal story. Thoroughly engrossing, beyond poignant and harrowing, oftentimes very shocking and disturbing (filled with war scenes so affecting, they fill your heart with sorrow and dread), but also breathtakingly beautiful, meaningful, heartfelt. And it's so fabulously written, so lyrical and evocative, so honest and brave, so damn compelling... I don't think I have ever read anything quite like it. It is definitely an impactful story, both emotionally and intellectually. And I am glad I got a chance to read it. The writing style is what really stands out. It makes Charles and Hensley's story truly unique and unforgettable. They are both very intelligent and sensitive people and seeing - and experiencing - WWI through their eyes, was utterly fascinating. Thanks to the dual narrative, we get to experience the war both first hand and from across the ocean, and we can get a feel of what it was like to be there, see the blood and smell the smoke, but we also get to see what it felt like for those who stayed behind. I don't know what else to say, I find myself speechless. This Is How I'd Love You is a book worth reading. I highly recommend it. Hazel Woods lives in New Mexico with her husband and two children. For more information please visitwww.hazelwoodsauthor.com. You can also find her on Twitter.